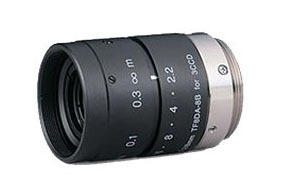 The Fujinon TF8DA-8 is a 8mm fixed focal length lens with a working aperture of F2.2 to F16. It’s designed for a 1/3 Format 3-CCD C-Mount camera. It’s low distortion light weight design make it suitable for a wide range of high quality imaging systems.